Many excellent recipes throughout the book. To date I have made about 3/4 of them and all have turned out amazing. The only drawbacks: there are no pictures of any of the finished dishes; and it may not be the best for someone with no cooking experience due to some vague instructions such as "cook until meat is tender" - which in the case of the lamb dishes may take 90-120 minutes.What I love about Afghan food (besides the incredible depth of flavour) is that most of is not stressful to prepare; with long slow cooking times of many main dishes, there is plenty of time to do other things while it simmers. After trying Afghan food from a Melbourne takeaway I decided I needed to learn how to make it at home, and, fortunately I stumbled across a copy of this book (several copies actually) at a second hand book shop.This is a solid variety of Afghan recipes, and includes favorites like burani bonjon, manti, aushak and qabili pulao (which my husband is a big fan of). Some of the dishes are reminiscent of Iranian food (especially the pulao (rice) dishes), others have more in common with Pakistani food (chappli kabab, samosas and pakoras), but Afghan food has its own unique qualities, and is worth learning. Most of these recipes are cheap and easy to prepare and are healthy nourishing food. 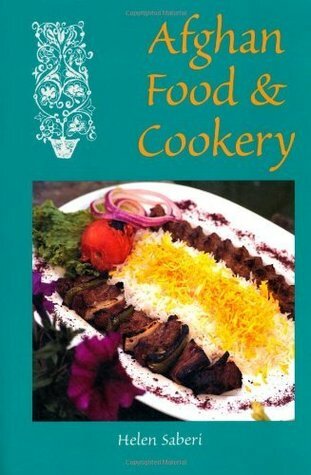 The author includes tips on how to get your rice to turn out perfectly and two techniques to use (I'm a fan of the 'sof' parboil, drain and steam method myself). I cooked burani bonjon last night and it was delicious as always. If you've never tried Afghan food, and 'Afghanistan' only brings to mind images of war and misery buy this book. It's a testament to a wonderful food culture kept alive by hardworking women in the face of tragedy and instability, and the book's anecdotes and reminiscences helped me understand that there was a bit more to Afghanistan than what you see on tv. Also if you ever get a chance to go to an Afghan restaurant absolutely do so, it's some of the best food I've eaten- even my fussy three year old loves it.